In the past Zalman has produced some fantastic products, a couple that come to mind are the Zalman GT1000 case (which we reviewed here), and the Resorator XT Watercooling Kit (which we reviewed here). Now the folks over at Zalman have decided to merge the GT1000 case and the Resorator XT Watercooling Kit together into a brand new case, the Zalman LQ1000. This case takes the best features of these two already great products and merges them into one, and the resulting LQ1000 case not only looks incredible, but also has great functionality and extreme performance, and for that reason the Zalman LQ1000 case has earned our Editor's Choice award for Cases at CES 2008. SSD hard drives are still fairly new products, but their ability to improve hard drive performance has made them extremely attractive to consumers. Ridata has released their 32GB Turbo SSD, and the performance is fantastic. At their booth at CES 2008 they had 4 of these drives in a Raid 0 set, and were able to load Crysis maps in under 18 seconds (Typical HDD load times for Crysis ~1:45 minutes). This extreme performance carries a hefty pricetag, but the increase in performance is dramatic, and for that reason the Ridata 32GB SSD hard drive has earned our Editor's Choice award for the Computer Hardware Components category at CES 2008. If you live in North America chances are you haven't heard of BlueAnt, but they are an Australian company that has a fantastic lineup of Bluetooth devices, and the Z1 Bluetooth Mobile Headset they announced at CES 2008 is yet another great product in their lineup. The Z1 is similar to BlueAnt's popular Z9 headsets, but can be completely controlled by voice commands, eliminating the need to fumble with your headset trying to pair with your mobile device or send and receive calls. Before CES 2008 I had never heard a product made by Able Planet, but after hearing their products I was very impressed to say the least. For those unfamiliar with Able Planet, they originally began as a hearing aid company, and take sound quality serious, and have kept that in mind when releasing a product line to the general public. 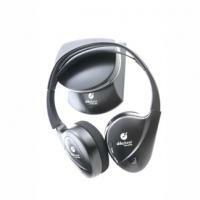 The Able Planet IR400 Wireless headphones are a great product, they have fantastic sound quality, have great build quality, and are priced very competitively, especially when compared to other "high-end" audio headphones to which they outperform. For those reasons the Able Planet IR400 Wireless Headphones have won our Editor's Choice award in the Wireless Technology for CES 2008. When we stopped by Thermaltake this year at CES 2008 we had the chance to check out all their new products, and one in particular really caught our eye, the Thermaltake Blac-X Hard Drive Dock. The easiest way to explain this product is to compare it to an iPod dock, except instead of an iPod you can drop any 3.5" or 2.5" hard drive into the dock and have it instantly connect to your PC. 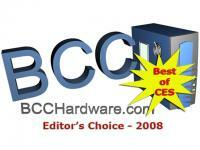 This product is the perfect accessory for any enthusiast that has hard drives that they need to be able to access quickly, and for that reason the Thermaltake Blac-X Hard Drive Dock has earned our Editor's Choice award for Computer Hardware Accessories for CES 2008. Coolit has been gaining a great reputation as being one of the premiere cooling companies in the world. Coolit has become well known for such coolers as the Freezone and Elimitor which are aimed at a high-end market, but with their newest product the Coolit Pure, they have a product that appeals to the consumer who wants a high-end cooler without a huge pricetag. The Coolit Pure is a closed-loop watercooling system that combines facets of water-cooling and air-cooling, and provides a quiet, effective, reliable, and affordable (Estimated MSRP ~$140.00 USD) cooling setup, and for that reason the Coolit Pure has earned our Editor's Choice Award in the Cooling (Computer Hardware) category for CES 2008. 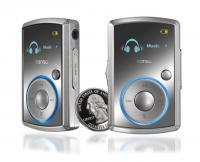 This little MP3 player takes portable MP3 players to a whole new level, and still looks good while doing it. The Sansa Clip comes in 1GB, 2GB, and just announced at CES 2008, the 4GB. The price of these players is what is truly remarkable, with the most expensive of the bunch being the 4GB with a MSRP of $79.99. Functionality, size, and great value have earned the Sandisk Sansa Clip our Editor's Choice Award in the Personal Electronics category for 2008.